Frestems is a specialist manufacturer of military evacuation equipment, producing military ambulance vehicle interiors, stretcher platform solutions and stretchers / litters. Frestems has wide experience in creating ambulance solutions for all types of military vehicles from soft to heavily armoured ambulances as well as for old and new vehicles. Frestems solutions are widely used in military ambulances and medical evacuation vehicles in battlefields and crisis areas around the world. Frestems is the preferred choice for military customers due to the quality, safety and functionality. The design of Frestems’ platforms and stretchers is unique. Telescopic platforms, automatic stretcher locking systems and lightened loading mechanisms allows for safe, rapid and patient / casualty-friendly evacuation. Frestems delivers a wide range of products, including hydraulic lifter and multifunction platforms with optimised loading heights, stretcher hoists and multiple-stretcher place platforms. The platforms fulfil military standards and are tested for safety and reliability. The ProMIL 245 treatment base is an innovative solution for loading stretcher patients into high MRAP-type vehicles. 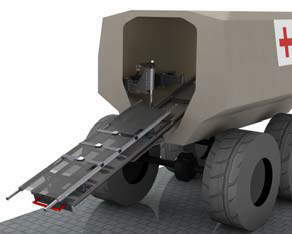 The system uses a 3D motion to extend through the center of the vehicle to the best possible stretcher loading height thus transforming an MRAP to an excellent ambulance. The ProMIL 245 enhances mine protection with the pivoting arms, bearings and locking units designed to dissipate the energy of the blast. 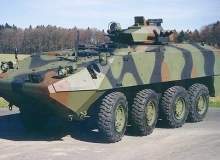 The platform is specifically designed for wheeled APC’s and other high vehicles to give an optimal loading height. The platform has automatic stretcher locking and it is compatible with numerous stretchers. The modular platform also enables manoeuvring of the fastened stretcher in various directions. The system is durable and designed for heavy usage. The ProMIL 240 Foldable stretcher platform can be used in medevac vehicles where space is limited or where the vehicle is used for several purposes. This platform is wall mounted for mine protection, can be folded to the side, under the seating, when not in use and extends out for easy loading. The ProMIL 440 is a development used for large-capacity evacuation. It has four sliding-stretcher bases with automatic stretcher-locking, and can be installed easily in various vehicles and vessels, including vans, trucks and combat boats. This product is a preferred solution in catastrophe, natural disaster and crisis operations where large quantities of patients have to be evacuated rapidly. The ProMIL 217 is a Nato stretcher and complies with the Nato stretcher standard Stanag 2040. This field stretcher is lightweight, with a sliding patient-fastening strap and extractable handles. The materials are easy to sanitise. The ProMIL 215 is a compact solution for transporting patients over distances of punishing terrain. Once the patient has been transported, the cart functions as a bed, stabilisation station, or a treatment and surgical surface. 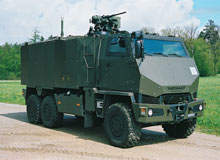 Frestems designs and manufactures equipment for the conversion of military vehicles into ambulances. Careful planning and detailed design combined with an extensive experience in ambulance manufacturing is applied to compose ambulances specified for their end-user environments. In close co-operation with customers, various aspects of the medical vehicle are re-designed and new components installed for ambulance use. These include treatment bases, stretcher platforms, cases for medical equipment, floor heating, interior linings (insulation), alarm lights, power outlets, oxidation systems and additional storage space installations. The strain caused by accelerations to the patient in a moving vehicle can be hard to bear even in wheeled civilian ambulances, not to mention in tracked military vehicles driving fast off-road. Frestems has sponsored a special report on next generation stretcher systems for military ambulances and medical evacuation vehicles. 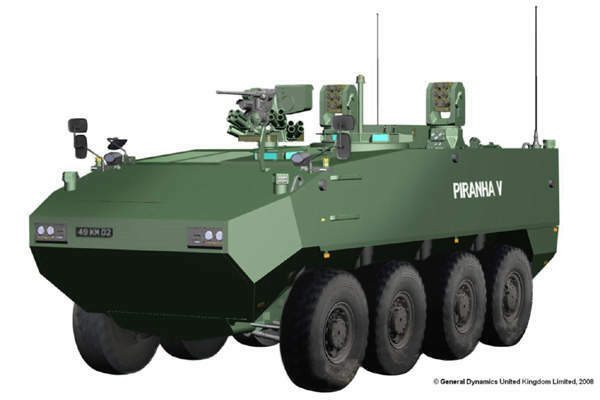 Duro is a high-mobility military tactical vehicle developed by General Dynamics European Land Systems-Mowag in Switzerland. Frestems is attending the Eurosatory 2012 exhibition in Paris, France, taking place on the 11 - 15 June 2012 at the Paris Nord Villepinte Exhibition Center in Halls 6, 5a and outdoors.